The amber-coloured El Dorado 5 Year Old Demerara Rum smells like luxurious dried tropical fruit. It has flavours of fruit, caramel and toasted coconut, fading to vanilla. Very complex and balanced for a relatively young Rum, and outstanding in cocktails. 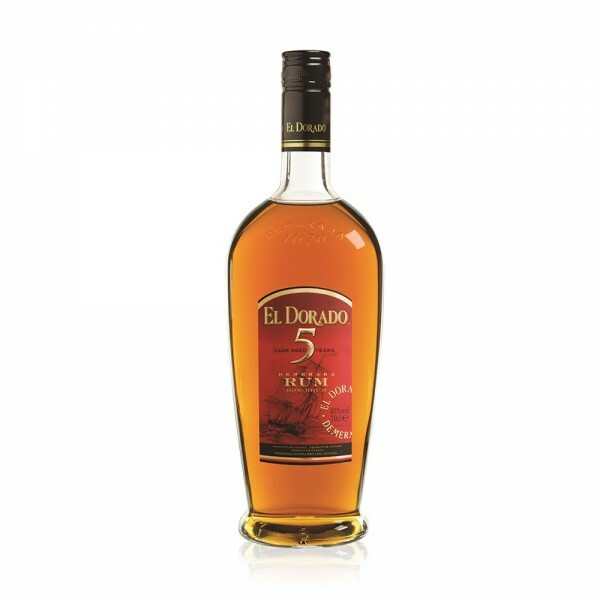 El Dorado 5 Year Old is made using the world’s only wooden Coffey still, and was awarded with the prize for “Best Golden Rum under 6 Years Old” at the 2010 Golden Rum Barrel Awards. It was also voted the ‘Best Pouring Golden Rum' in Imbibe magazine in 2011, and won a ‘Best in Class’ medal at the 2011 International Wine & Spirits Competition.